Parasitic bird mites present a significant threat to poultry production. Increasing reports of bird-mite attacks on humans suggest that avian ectoparasitosis (gamasoidosis) may be of increasing medical concern. 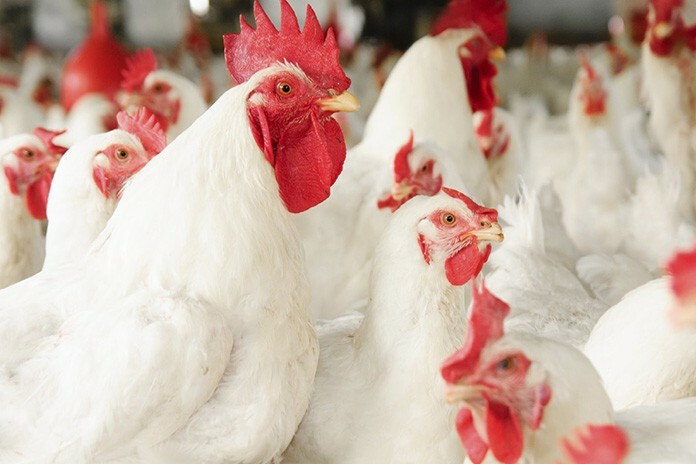 This may be of particular interest to those living or working in close association with poultry, as the species most often responsible are typically linked with domestic fowl (i.e. Dermanyssus gallinae and Ornithonyssus sylviarum). Though the threat that bird mites pose to poultry is relatively well understood, the risks posed to humans have been less well explored. The potential health risk presented by gamasoidosis is exacerbated by the fact that bird mites such as D. gallinae can carry and transmit zoonotic diseases. Though the vector capacity of these mites is still an emerging science, mite-to-bird transmission has been demonstrated in a number of cases for D. gallinae, increasing the likelihood that relevant diseases carried may also be passed from birds to mammals, humans included. Examples of disease spread to humans through bird mite vectors are rare in the literature, though transmission of spirochetes, rickettsiae, Salmonellae, Bartonellae, Pasteurellae, Sporozoa, hemogregarines, flagellates, and filariae have all been suggested, with more recent evidence supporting acquisition of Bartonella via Dermanyssus spp. per se. The results of a recent review support that reported cases of gamasoidosis are increasing throughout the globe, with evidence that the majority of cases are linked to D. gallinae, and that mammalian companion animals and livestock may also be at risk. Further survey data from a subset of individuals afflicted by gamasoidosis confirm wide-spread occurrence, supporting the vector capacity of the mites responsible and adding Lyme disease to the expanding list of pathogens potentially transmitted by these mites (Table 1). 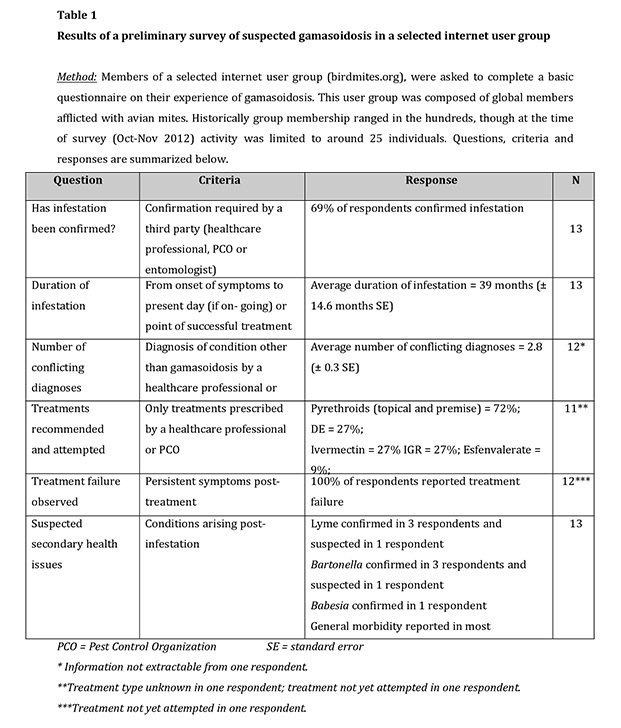 Other issues identified through this survey included widespread misdiagnosis of gamasoidosis and (in some cases related) treatment failure and persistent infestation (Table 1). Diagnosing gamasoidosis based on presenting symptoms (as is often undertaken) is inadequate and a suspected cause of large-scale misdiagnosis for similarly presenting parasitoses, such as scabies and pediculosis, general dermatitis or physiological conditions including delusional ectoparasitosis. Treatment is equally problematic, with species such as D. gallinae being hard to target and widely resistant to standard acaricides. Furthermore, the different mite species concerned display varied ecologies (with some living on hosts and others residing off hosts and feeding intermittently) that necessitate divergent treatment approaches. 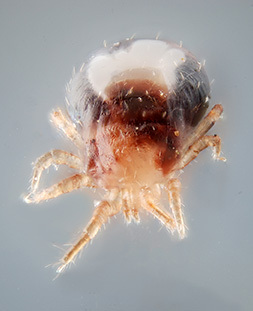 In cases of human infestation, positive identification of species (or at least functionally similar groups based on life-history patterns) and recommendation of suitable treatment requires an understanding of mite taxonomy and ecology that many healthcare professionals and pest control organisations do not currently possess. Overall it appears that although reported cases of gamasoidosis on humans remain relatively rare, D. gallinae represents a species of particular concern to medical health due to its reported genetic plasticity, occasional evidence of permanent infestations on mammals, and high vector potential. Previous review suggests that incidences of gamasoidosis per se may be exacerbated by increased mite-novel host encounter rates and occurrence of certain ‘risk factors’ in the ‘new’ host, such as a breakdown in immune function. It follows that rising human populations, with anticipated increased incidences of immunocompromised individuals as a result of modern medical practises, may further promote gamasoidosis. Though only preliminary, work in this area suggests that more attention should be given to gamasoidosis as a threat to human health, supporting that the mites responsible, and especially D. gallinae, could be considered an ‘occupational hazard’ to those working with poultry.Though cases of gamasoidosis have been reported since the 17th century, documented in the leading medical literature since at least the 1920s and reviewed twice in the last 15 years, the full extent of gamasoidosis as a threat to human health has still to be explored.